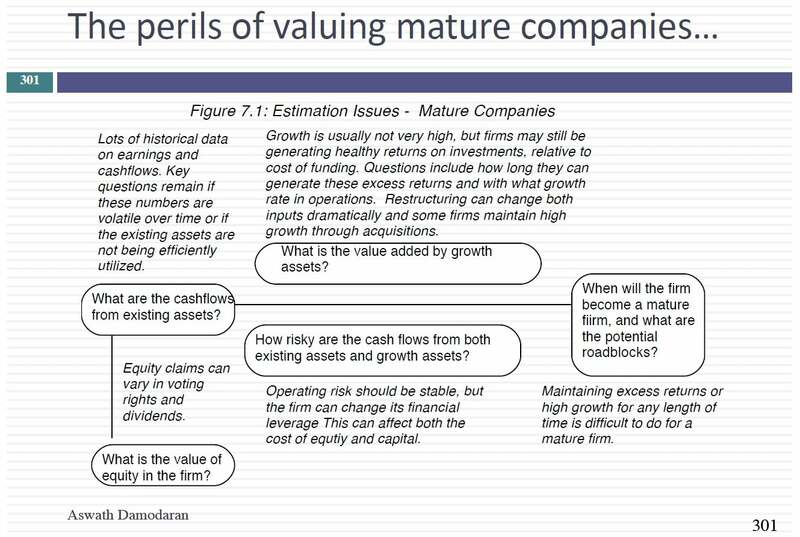 We continued our excursion on the dark side of valuation by first looking at mature companies on the verge of transitions, and how you can use the two values (status quo and changed) to derive a value today. We then moved on to emerging market companies, where concerns about country risk and corporate governance have to incorporated. After a discussion of how valuing banks is now more difficult than historically, we examined how to estimate free cash flows to equity for a bank. If you are interested, my Deutsche Bank Valuation is explained in this post. So I thought I'd start today's class again with some of the issues you run into valuation. We've talked to few about a few of them. So let's assume that you're looking at commodity companies. Let's start with the truism. The earnings for commodity companies will go up and down as commodity prices go down. So given that earnings go up and down we also expect that values to go up and down as commodities say this is what I'm asking because we know earnings go up and down. They. Truly expect the value to all to then be a function of where the second. May have made the questions easier. What do you make your value go down with the earnings if you built the module you take baserunning say and you always apply a positive growth rate right because then after a good year your company is going to be worth a lot and badly. It's going to be worth less so if you just make mechanical valuations guess what your values go up and down as earnings growth. But your job and valuation is to look past the cycle. So one of the things we're going to talk about today is what do you do with commodity companies when you know that your value is a function of the commodity price but you have no idea where the commodity price is going which is pretty much how I would characterize pretty much every commodity now. That wasn't always true. In the 1980s oil companies used what they call the normalized oil price which they used for making big decisions about twenty five dollars because they said the price goes up above 35 comes back to 25. And it worked for almost 15 to 20 years and then they moved to 40 dollars and it seemed to work for a while. And then of course you had. That boom for a period and then you had the bust and then people waiting for the boom again and not happening. And now I think people are just incredibly confused. I think next week we should value or Codys think because you report just came out most profitable company in the world. And I just I just talked about it. So I did start putting things together. You start pulling things from the Ramco of course is where do I get that annual report. You don't. There is no annual report. It's all these flick to trick loads of information they reveal. So it'll be interesting because you're early not valuing Aramco you're valuing Saudi Arabia Inc because the line between Saudi Arabia and Iran. Is. It you don't know where the company ends and where the country begins. It's a messy valuation. So maybe we'll try that next week. Let's talk about so we'll talk about what to do about the fact that because it's a give you you can't complain you can complain about everyone but devaluated replied. So let's assume now we move two bags today. If I get a chance to hit the very end of the session I might talk about valuing banks how it's become so much more difficult to value banks. So you have a regulatory capital ratio so you go bank where it's very conservatively capitalized it's regulatory capital ratio is much higher than the regulatory minimum. So when you look at this bank and you say where is the fundamentals. Would I expect to see it. I'm going to discard a few combinations so this is the bank that is very conservative capitalized. Tell me what you should expect to see in this bank. Truly expect to see a higher return in equity and low risk. Why not. Because you know a lot of capital to turn inequity is going to be a low risk fard holds. But you're probably not going to see higher turnout equity if you do it's a it's a bargain issued by the bank to be a conservative funded bank. You should expect to see lower tons in equity and lower risk. You're saying that's obvious. But the mechanisms we have for bringing into bank valuation are very limited because until. It's still true in many cases that banks are valued using the dividend discussable way the cost of equity is actually the average cost of equity cards. Banks We actually don't adjust for differences across banks because this debate is not what you can use to change this. So when to talk about what to do when you have a risky bank as opposed to a safe bet and I'd be quite honest 10 years ago this this debate wouldn't even have come up. I don't even know what to make because the assumption was regulatory authorities would keep us from ever having to value risky banks because banks are not allowed to take that kind of risk to stop. So we're going to wrestle with banks because to me that's become this new dark place to go and valuation is how do you value a bank. One final thing is when you're done with you know as many as you did and you come up with the value that's different from the price. I won't even ask you to answer this question because this is a question you shouldn't answer. You should just do. You've got to value is different from the price. What do you plan to do now. I'm going to talk about that word faith again. And I'm going to talk about why it's so difficult to maintain it and how it gets tested. Because that's why we do valuations to be able to act on it. And it's really really really difficult to pull the trigger. And you've know you pretty.